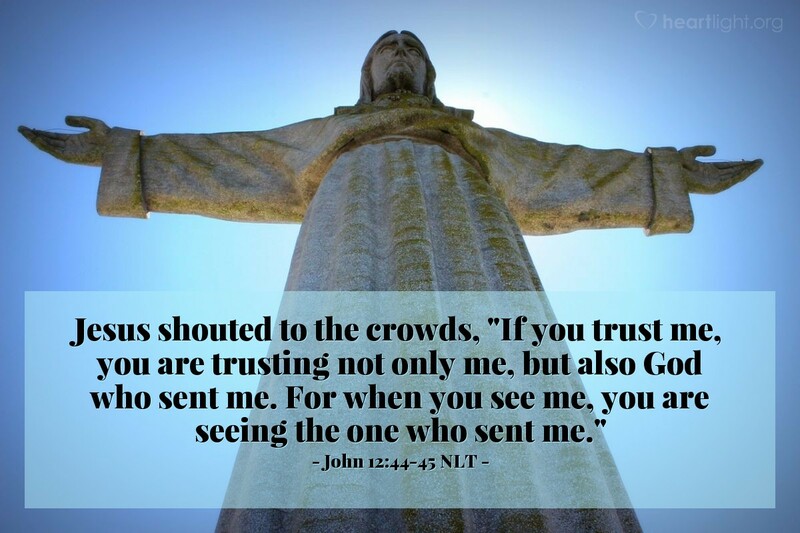 Jesus shouted to the crowds, "If you trust me, you are trusting not only me, but also God who sent me. For when you see me, you are seeing the one who sent me." Want to know what God says? Listen to Jesus! Want to know how God treats people? Watch what Jesus does! Want to know what God cares about? Pay attention to what Jesus says and does! Throughout the Gospel of John, Jesus claims to speak and act as God would. In fact, Jesus claims to be one with the Father. So the real choice for us is whether or not we are going to trust him with our lives. Holy and almighty God, please forgive my little faith. Please bless me as I continue to seek to know you better by reading and meeting your Son Jesus in the Gospel of John. I ask that you make yourself known to me as I seek to live for you each day. In the name of the Lord Jesus, I pray. Amen.